Home » Antabax » Bio-home » cash » Fruitale » Labour » Lam Soon » May » Orchid » purchase » Raya 2018 Contest » spend » WhatsApp » Zip » Peraduan Raya Fiesta Berganda Contest: Win Up to RM110,000 Duit Raya! Buy at least RM20 worth of any Lam Soon Edible Oils products (Antabax / Labour / Fruitale / Zip / May / Orchid / Bio-home) in a single receipt. One (1) receipt entitles to one (1) contest entry. List down any three (3) of participating brands in this Contest. Attach a clear and complete photo of your receipt and WhatsApp it together with your answer. Keep your original receipt for verification purposes. 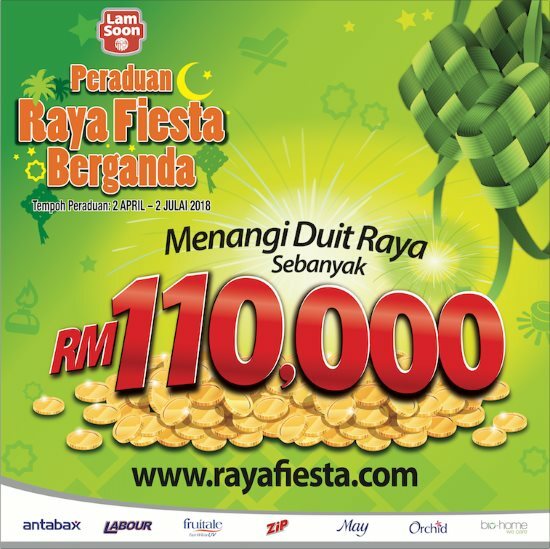 Visit Peraduan Raya Fiesta Berganda contest page for more details.